Not a training week, a tapering week for the Half on Sunday. Monday & Tuesday — rest after the 17k of hills on Sunday. Quads sore! Wednesday - 12k with 1000 x 5 and 500 x 2 easy - 5:00/k pace. Quads still sore. Thursday — 40 minutes easy. Quads seem ok but legs still tired. 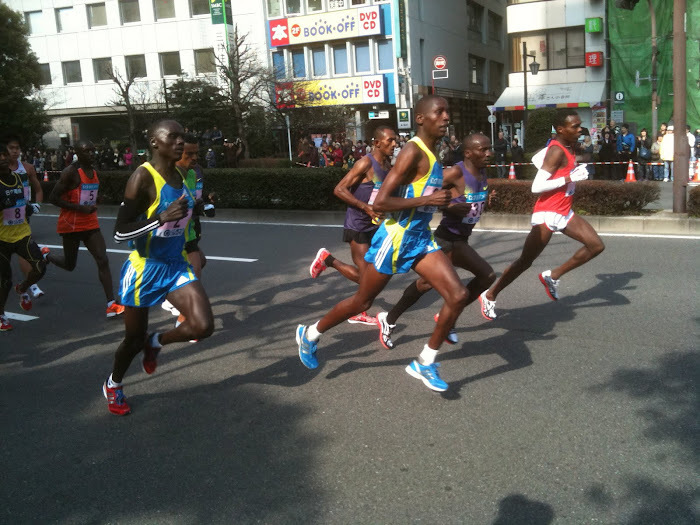 Toda Half Marathon in Saitama prefecture, just a little north of Tokyo. My favorite race, nice course twice around a lake, flat except for two small hills (x2). Weather was good, about 18C/64F, sunny. One of those days where it's warm in the sun and cool/chilly in the shade - perfect for running. There was a slight wind, against or behind depending on where you were on the course, but not much of a factor. My plan (hope) was to run under 1:35. That required kilometers of 4:30, which would be 1:34:56. So I wanted to pick up the last 6k, if possible, to be sure of getting under it. In previous years I have done that on this course, so I was hoping that I would be mentally prepared and physically capable of doing it again. I had guys to run with most of the way, and when I didn't there were people ahead to chase (about 2,500 in the race - there was also a 10K with 1,500 and a 5K with 1,000). By the way, another goal was to finish in the top 6 in the 60s age group - top 6 get prizes. So an added incentive the last 6k was that I could see (there are several switchbacks that made this possible) two guys 50m and 100m ahead who looked like being in the 60s age group, so I wanted to pass them...which I did, between 16 and 17k. Then with 2k to go, I noticed another guy ahead so pushed the aching legs to try to catch him. Halved the distance, but couldn't get him. Fortunately, he finished 5th and I was 6th. So the last 2k was a bit tough, but all in all I felt good and ran a good race. The prize was a towel...but a nice towel. And by the way, I have the second fastest time at this race for the 60s age group - a 1:23:15 when I was 60. Am I wrong to say that those splits look absolutely ideal? A nice progression home. A plan well executed. You'd have to be wrapped with that. I'm looking forward to my 60th ... faster times ahead for all of us. Good racing Bob. I like the description of you catching those (slightly) old dudes in the last 5k. Enjoy the build-up for the race in April.